A modern take on the classical 'Kiwi Bach', this holiday home is perfect for groups or families, with 2 bedrooms and open plan living, dining and kitchen with modern decor, furnishings, double glazing, insulation heat pump and wifi. 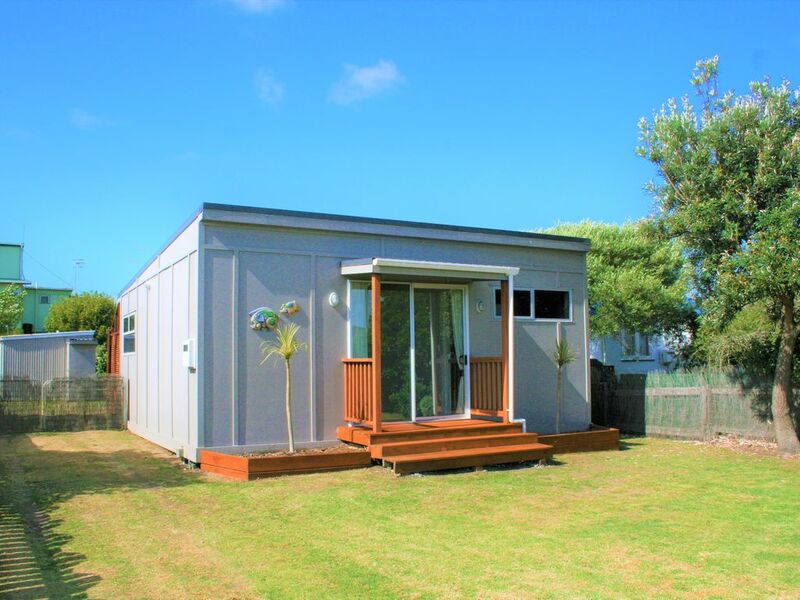 This holiday home is central to a number of great activities, walkways, parks and a number of fantastic kiwi eateries in Foxton Beach. Based on a traditional kiwi bach, the property underwent an extensive modernisation in the late 2000's, adding insulation and double glazing, and we’ve just had a heat pump installed to keep you warm in winter and cool in summer. The Bach includes a Queen bed in the main bedroom, and a bunk bed in the second bedroom with a double on the bottom and a single on the top. There is also a fold out sofa bed in the lounge for extra guests. Sheets, duvets, pillows and towels are provided for all guests. Well fenced for pets and children. The property includes a sleep-out which is yet to be renovated and used for storage at the moment, with items such as boogy boards, sports equipment, beach equipment, picnic sets etc at your disposal. The sleep-out also has an additional toilet and shower. Bach also includes port-a-cot and high chair for littlies, as well as various toys, board games, indoor activities and unlimited wifi. Hi there, I’m a ‘40 something’ Project Manager, with a love of New Zealand and the outdoors, and enjoy sharing travel experiences with my young family. Perfect for families or people just passing through wanting a relaxed, modern, warm place to stay. Well fenced for children and pets. Also includes port-a-cot and high chair for littlies, as well as various toys, board games and indoor activities. toilet, shower, Extra bathroom located in the sleep out. Main bathroom includes washing machine. A sneak peak of the estuary of the Manawatu River from the front porch. Password details in Bach info book. 2 Adult and 2 Child. We loved our stay and so awesome to be able to share with our pooches. Super clean and everything you need for a getaway. We will be back! We loved the bach. It was clean, well stocked & supplied, it was secure for our dogs and next door to Mr Grumpys fish & chip shop. Perfect! The location was great for lots of walking and relaxing. Thanks for making it available to us. Such a tidy cute Bach, excellent location and great fenced yard for dogs and kids. Would happily stay again. Thanks Emma, it was a delight to host you and we’d welcome you back any time. Many thanks. Lovely place with everything we needed. Approx 500m walk to Childs playground, skate park and pump track (currently under construction), or approx 750m in the other direction to the Foxton Beach Boat Ramp. The Beach is approx 5 mins drive by car or 10 min bike ride. Short stroll to popular White Rabbit Cafe and award winning Mr Grumpy's fish and chips.